In The Field of Blood, Freeman shows that the 19th century was generally a much more violent time, but there was also the fact that Southern congressmen hailed from an honor-based culture where dueling was frankly expected, which mystified Northern congressmen—whose constituents thought poorly of the custom. And representatives from slaveholding states were not shy about bringing to those tactics to bear as the debate over slavery’s place in America’s westward expansion grew more and more heated. Press accounts of the fight vary, but they generally agree that John “Bowie Knife” Potter (R-WI) and the fighting Washburn brothers—Cadwallader (R-WI), Israel (R-ME), and Elihu (R-IL)—stood out int he rumble, with the barrel-chested Potter jogging straight into the scrum, throwing punches as he tried to reach Grow. At one point, he slugged William Barksdale (D-MS), who mistakenly reeled around and socked Elihu Washburne in return. (Elihu liked his Washburn with an “e.”) Potter responded by grabbing Barksdale by the hair to punch him in the face, but to his utter astonishment, Barksdale’s hair came off; he wore a toupee. The slapstick humor collapses under the sheer weight of the importance of these debates and the realities of slavery. And ultimately, Freeman is telling a story about norms—mystifying though they seem to us—and what happened when they are rendered meaningless. 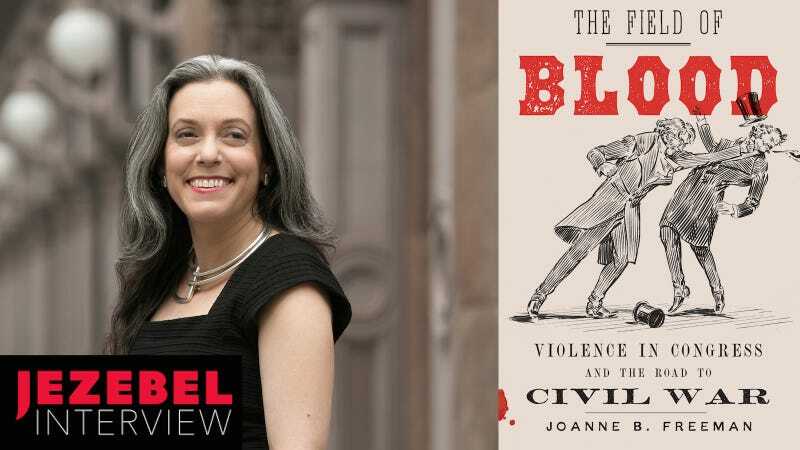 I spoke to Freeman about what these fights looked like, how they were used as a sort of gag rule of violence on anti-slavery advocacy in the years before the Civil War, and what it’s like to watch our current political moment unfold as a historian. (Nerve-wracking, it sounds!) Our conversation has been lightly edited for clarity and length. There’s this aura of staid dignity in our popular image of the 19th century. The idea of the 19th-century is a statesman like Daniel Webster making speeches that school kids would memorize. But your book is basically 270 pages chronicling what are darkly comical brawls in Congress. To what extent were congressmen actively violent in Washington in the decades before the Civil War? I guess partly because some of these incidents are so dramatic, it might seem as though all of Congress was a brawling sea of crazy guys. But there were violent people in Congress. There were violent people in state legislatures, too. Not everyone in Congress was violent, but every Congress did have its violence. Pretty much every Congress had at least one mass brawl where there were lots of guys smacking each other around. And I guess one of the points that the book really makes is it wasn’t necessarily happening all the time, but it was routine. It was not a surprise to anybody that this was going on, and even beyond that, it was strategic. It was a legislative ploy. I think that’s what fascinated me the most. It wasn’t like tempers would run hot and people would just get in a fight because they were angry—this was an actual part of the way that debate would happen. So if you could just outline for readers—insofar as you could say there was a generic shape to one of these fights, what were the contours? How would one of these fights unfold? How was it used? Pretty much every congress had at least one mass brawl where there were lots of guys smacking each other around. But one way in which these fights would work is that someone would say something anti-slavery, and a Southerner would do something typically intimidating back, whether that meant pulling a weapon or, or saying something insulting or threatening to see what this Northerner dared to do, or tossing off a little bit of semi-dueling language to see if that kind of a threat might shut that person up. There were committee meetings where if a Southerner didn’t necessarily like the way the committee meeting was going, he might say something like, “We’re not leaving this room until we get what I think we need to get in this report,” with clearly an intimidating tone, so either people would resign from the committee or they would give in. One of the things that I never stopped being both amused and surprised by was the degree to which particularly in the House, other men would jump up on desks and chairs to watch. There’d be a rush of men over to where it was happening, some of them to break it up, some of them to join in. There’d be a time of flurry in which, if it ended up showing up in the congressional record, it would be described as “indescribable noise and confusion.” And then people would settle down, and more often than not, they would go back to work. That’s what was really interesting to me—the idea that this could happen was a fact of life that people worked around or strategize around. Giddings would proceed with a speech on the thought that, “I am not afraid to have one of these guys rush at me; if I get really provocative and one of them does, then basically they’ve given me what I want.” He’s factoring that into the way he thinks about his positioning on the floor. Exactly. I was speaking about the book recently to someone and they asked me about the gag rule and the big debate over the gag rule in the House of Representatives to basically not allow debate of anti-slavery petitions. And I call it this in the book and I called it this in the discussion—there was a gag of violence, too, that was being deployed in that same strategic way. Which, certainly when I began the book I had no expectation of that. You’re sounding surprised—it surprised me as well. You point out in the book that for a lot of the congressmen from the slaveholding South, abolitionist speech considered is dangerous speech, and you cannot be critical of the institution in their home district. Then they get to Congress, and it’s an anathema to them. So they experience it as this personal insult, which kicks the whole dynamic into this dueling scenario. Were they really feeling that? Or were they saying, we’re going to use this script to shut these guys up? Was it a bit of a mixture? I think it’s a mixture. Certainly, when you read the period’s equivalent of the congressional record or you look at the private letters of people, there was sincere outrage. Someone like John Quincy Adams would really get into a roll and be out there attacking slavery and there would be howls of outrage, and some of that was just sincere howling with outrage. At the same time, there was an assumption that if they were loud and aggressive enough, they might be able to shut some people down. It’s a point I make in the book and it’s an important one—in the South, particularly in the deep South, Southerners aren’t confronting this kind of aggressive confrontation on a daily basis, possibly never in some parts of the South. So it was both strategically and politically dangerous to them—and it was also personally insulting to them. That’s part of the dynamic of the book—that political and personal are bound up in such an interesting way in Congress. Part of what got me interested in the first place is that these men are standing in for all that they represent, and they feel that. They’re acting partly on that in a sincere way and partly on that in a performative way, because they know their constituents are watching and their job is to represent them. That’s part of the dynamic of the book—that political and personal are bound up in such an interesting way in Congress. So even in the case of Southerners, I don’t want to give the impression that they’re just bullying and there’s nothing sincere about what they’re feeling. I think there is some sincerity to their sense of outrage. So partly they’re responding strategically because they know that gives them an advantage. I also think they feel threatened as far as what this might mean for the South, and I think they are sincerely responding emotionally to what’s going on. It’s interesting how it’s a tale of two cultural paradigms. You talk about how there’s this whole Southern code of honor that involves dueling and there’s this very structured process, and they’d get into altercations with these guys from New Hampshire who no familiarity with it, their constituents disapproved of it, and they’d literally have to enlist border-state translators, which is such an interesting image to me. That was fascinating to me, too. A whole chapter in the book is about one particular duel in which one congressman gets killed. One of them is from New Hampshire and one of them is from Kentucky, and the Southerners keep acting on these dueling customs in the way they assume it’s supposed to happen, and the poor folks from New England, they don’t quite know what to do. There’s a moment at which Henry Clay is advising these Southerners, and he says—no, no, no, let me explain to you how Yankees think. Let me tell you what they think is happening right now, and then this is what you say to make it clear to them that this is what you mean, because they don’t understand what is going on. And Northerners by this point assumed that their constituents thought dueling was a barbaric Southern practice, and they knew that engaging in anything having to do with dueling potentially would cause them to be ostracised back home. They also knew that turning around and backing away from any and all challenges might also make them be ostracised back home, because they wouldn’t be representing the interests of the people that they represented. I think somewhere in the book I call it the Northern congressman’s dilemma—they really had to strategize their way through that situation, which is part of the advantage that the Southerners are taking advantage of. Where were the constituents in this? How seriously was the fighting taken by the public at large? It’s a tricky kind of an answer. In the 19th century, Congress really was the star center of national politics. It had the most column inches in the press. It’s remarkable the degree to which people would be reading along with the debates in the newspaper. Newspapers would print lengthy abstracts of the debates, and there would be these comic magazines that the humor in them was entirely grounded on the assumption that their readers were following really closely these debates so that they understood the punchline. Congress in this period was a big deal. Constituents generally were tuned into what their congressmen were doing and certainly would have known if their congressmen were defending them with gusto on the floor. However, for a time, the violence isn’t necessarily being reflected with any great degree of detail in the press and certainly not in the equivalent of the congressional record. So, you know, congressmen wanted to be seen really standing up for all that they represent, but they didn’t want to look like blustering, crude bullies. At the same time that constituents were attached and engaged and responsive, they were only seeing part of the picture. It was really interesting to read about how you had to triangulate the truth of all these conflicts—the congressional record would say something like, “there was an argument of a highly personal nature.” You had to put together several pieces of information to get the truth of any given conflict; it’s open but hidden. That was one of the huge challenges of the book, and even to this day, there are some things that I couldn’t include in the book because I still don’t know if it happened. Essentially, much of the violence that I write about just isn’t in the record at all. A lot of it initially I found in private letters and diaries, but you can’t just assume that because someone put something in a letter that it was true. I would poke around in newspapers and journals and magazines and I would go to the record on the day that something supposedly happened and exactly, triangulate is the word I would always use. Because it really required piecing together little bits of evidence from all kinds of different sources, which generally speaking is what historians do. But in this case, there was such on one hand invisibility, or near invisibility, and on the other hand, such outrageous things going on, that the disjuncture between the two was shocking. Part of the reason the book took so long was this process, trying to figure out what happened, and then really getting the code of the congressional record. I learned that sometimes the record would say something like, “the debate became unpleasantly personal at one point.” In time I learned that that typically meant maybe someone hit somebody, or maybe somebody pulled a weapon on someone. That that was a sort of code for oh, and here we have a moment of personal combat, not just an unpleasant remark. It really was kind of a game of hide-and-seek, finding the evidence and piecing it together. It’s difficult because, especially early on, the press is so clubby in Washington. But with the invention of the telegraph and the advent of a national press, and it becomes harder to keep things just to the euphemism. How does the arrival of that national attention change the conflicts in Congress? And here’s a case in which technology and timing and politics all merged together in an interesting and ultimately unfortunate kind of a way, I suppose you could say. Even to this day, there are some things that I couldn’t include in the book because I still don’t know if it happened. In the late 1840s, the telegraph is really beginning to take off, and it means that within an hour, something that happens in Washington could be in one way or another communicated throughout the country. That really takes the spin control out of the hands of Congress. Before that point—you used the word clubby, which is an excellent word for it—there was a very strong press community of newsmen who basically worked in Washington. They would sit in the galleries and listen to the debates and then they would either go to the congressman and ask them to read over and see if it was accurate—or before they put it in the newspaper, congressmen would come and read over what the report was before it was printed. Congress has a lot of spin control, and they lose that spin control with the telegraph, because of the time component on the one hand—things communicate much more quickly—and secondly, the press community in Washington grows. They lose control of whatever message they’re trying to send at the precise moment as the slavery crisis is really intensifying because of western expansion. And both things happening at the same time—that pushes things toward the breaking point. Obviously, we live in a very partisan era of national politics. To what extent as you were writing did you see echoes across history from this era? It took me a really long time to write this book, and when I started, it’s not surprising to say the political climate was very different. It was easier, in a sense, when I began writing it, to just connect with the humor in what I was seeing and to be less emotionally connected with the deeper implications of what was going on. And obviously, over time, those deeper implications became front and center for me. I couldn’t avoid thinking about, at least, what it meant, what I was seeing. History doesn’t repeat. Sometimes it echoes, but it doesn’t repeat. But there are patterns over time that you can see—there are moments, or periods of time, when a cluster of things happens that causes the political atmosphere, the national atmosphere, to be really fraught. And some of them I write about in the book and they will sound familiar. It has to do with extremely polarized politics, an extremely polarized nation, political parties splintering and fracturing under that kind of tension, people losing trust in national institutions to really represent who they are and what they want, the press really jumping into that debate to have an impact and sway people, conspiracy theories being born and moved around in the press, Americans beginning to lose faith in each other and to accuse each other of not being American—these are things that, when I list them like that, it makes sense that they all go together. They’re all linked. It also makes sense that when all of that is happening, you’re going to have a hyper-fraught political climate. That happened in the 1850s. It’s clearly happening now. I think you could also say it happened in the 1960s. It happened in the late 1790s. So there are moments in American history when, for one reason or another, Americans recognize the fact that there is a pivotal moment in which something fundamental about America is being debated and decided. It makes sense that those are moments when this bundle of things intensifies that you get fraught politics. Obviously, over time, those deeper implications became front and center for me. What does it feel like to recognize as you’re working that you’re in a moment when you’re accustomed to studying them? This is the most schizophrenic, bizarre experience. On the one hand, my historian’s brain is saying, “Oh, isn’t this interesting! This makes me think of 1858.” My historian’s brain is thinking about the patterns and everything else. My Joanne Freeman American brain is really not being detached and thoughtful. Because I have this historical awareness, there’s probably an extra added level of freak out on my part, watching what’s going on and having, certainly, an understanding of the array of possibilities that may be born of this moment. I think it’s a really interesting time to be a historian, and a charged time. It’s a moment when history and an understanding of history are particularly important, because clearly our understanding of our past and what we think counts as history is going to shape the way that we address the present. I think that almost every day we’re seeing attempts to erase part of our past or minimize parts of our past—you know, some of them have to do with race and some of them have to do with gender—that have profoundly shaped where we are today. And it matters. An accurate, full understanding of our history—all of the good and all of the bad—is essential for dealing with any kind of a crisis. I think particularly at a moment like the present one, we’re making some fundamental kinds of decisions about what kind of a country the United States is going to be. It was interesting to watch the way the defensiveness spiraled. It was interesting to watch the Civil War happen as though it was a Charlie Chaplin movie with this horrible ending. If you’re writing a book that you know the endpoint is the Civil War, it’s a challenge. You don’t want people to be reading the book and having the characters in the book basically in one way or another reflecting the idea that, uh oh, only twenty more years and then we’re going to have that Civil War! They’re discovering the moment as it unfolds. They’re looking forward and not looking backward. I teach a lot about the American Revolution, and the same is true there. The phrase “the Founding” suggests that something was “founded,” and people at that moment—that’s not the way they’re thinking! Part of the challenge of writing any work of history, and certainly for me in writing this one, is writing it in such a way that you really in the moment with the people who were there, with their realm of possibilities and their sense that there were things that they could do to alter the path that things were taking. If you’ve ever taken a Civil War history class, you know about the caning of Charles Sumner. But there’s the rest of it underneath, which was really fascinating to see that event in its full context. Exactly. And I will say that the positive news as far as America’s understanding of its own history is that over the years I’ve been working on this, if I said congressional violence, people didn’t always necessarily know Sumner’s name, but they knew that there was a guy in Congress that was beaten really badly. Almost everybody would say, “Oh, there was that guy!” And I would say, yeah, there was that guy—and then there were 69 other guys! There were 69 other incidents. I think people assume that the one and only reason that the caning of Sumner was shocking was because it was violent, and as I discuss in the book, it wasn’t just the violence—it was the way in which it was violent, and the ways in which that attack was carried out that did or didn’t abide by what people assumed were the fair rules of violent combat in Congress. That’s the most fascinating part of all! The problem was he wasn’t given a warning that he was going to beat him with a stick, and he wasn’t beaten in the right place. Exactly, you didn’t give him a chance to arm himself before you hit him! No, it’s true. I guess the past is a different country. It is! But you know, the political aspect of that is—and this is the congressional component—for all that we’re talking here about violence and everything else, people wanted Congress to function. And so, the concept makes seemingly no sense, right? The “rules” of fair fighting. They didn’t stop the fighting. But if there was going to be fighting, they wanted it to be fair, because they assumed that Congress could be a functional institution, because people felt that debate was bound by fair rules and fighting was, too. It mattered to them that a fight was or wasn’t fair, in a way that as you say, might seem like the past is a foreign country because you would think that would really matter is if some congressman punches another one on the floor of Senate. But no! Was the person forewarned? Was the person present when an insult was given? Or was the insult given in the person’s absence? All of these things that seem ridiculously trivial, but were bound up with personal reputation and the reputation of the South or the North or the Whig party or the Democratic party that gave a seriousness to them. We think of norms as set in stone, but they’re highly contingent and negotiated; they change over time. Exactly, they’re informal yet formal. We’re living through a moment where norms are being challenged all the time. But it’s true that you assume that a norm is “the way things are supposed to be,” and it’s not until norms are challenged that you realize—well, they’re not legislated, they’re just a shared agreement that can be violated. And then what? What if you violated that norm? In the period that I write about in this book, there are norms of violence which we really don’t see as norms nowadays. Part of the book is talking about the ways in which that norm is being negotiated and how that changes over time in different ways with different political issues being debated at different moments.